AWS is collaborating in the collection of information on the distribution and abundance of camels in the Great Victoria Desert. 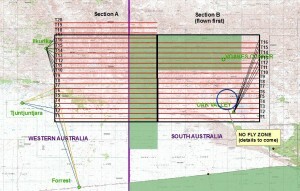 The project involves large-scale aerial survey across the South Australian and West Australian border. Transects are flown at 250 feet above the ground and a 200 m strip is observed on either side of the aircraft in which camels are counted. The results are then used to estimate camel populations in the region as a prelude to subsequent control. Kangaroo welfare is in free-fall.